I enjoying doing crafts since I was a child. I find doing crafts to be relaxing and enjoy it even when the crafts don't always turn out the way it is intended. Now my children and I enjoy doing crafts together. 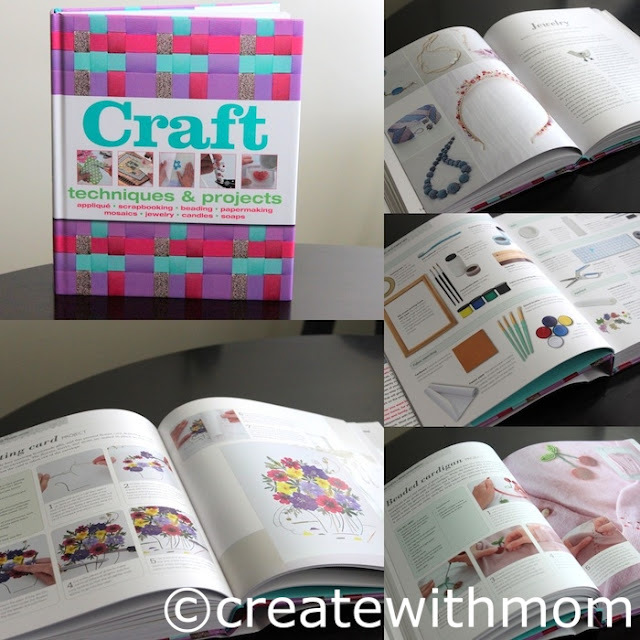 This fabulous Craft: Techniques and Projects book composed by a team of craft experts has loads of of ideas that is sure to please a lot of people. There are six sections in the book separated by textile, paper craft, jewelry, ceramics and glass, candles and soap, and eco crafts. All the projects come with details about the tools and materials. There are templates in the back of the book that are useful to do the projects. I enjoy quilling or doing paper filigree, so I chose to do this quilled flower arrangement project from the book and placed the finished project in a frame. Quilling is a centuries-old art of making decorative shapes with paper. This craft is lots of fun and addictive once you learn how to do it. I think to enjoy and do the projects properly we need to have the correct tools. I used quilling paper that is sold pre-cut, however if you wish you can cut 1/8" wide coloured paper using a craft knife. Quilling tool or the book suggests we use a toothpick, however I haven't used a toothpick to do quilling. Cardstock to paste the project. 2 tweezers helped me place the pieces. Toothpick and a post-it-note paper to put the glue. To create this project I used the quilling tool to roll the paper then let it unravel a bit. After playing with the lightly unraveled piece of quilled paper to make shapes, I glued the end so the pieces don't unravel all the way. I planned on how I want to place the pieces before gluing the quilled shapes carefully using the tweezers. After the project was completed I displayed it in a frame. This is beautiful and creative! I am going to try this and maybe add a butterfly for my daughters room :) Thanks for the share. Beautiful work. By using quilling paper we can make ear rings. This is very beautiful. A great unique idea to add in a frame.